"Next thing you know, Mr. Deeds' a millionaire, kin folks said...."
Everett Collection Raymond Walburn, Gary Cooper in Mr. Deed Goes to Town, 1936. Stars: Gary Cooper, Jean Arthur. I have been taken to task for a remark in this column two weeks ago concerning the dullness of the future, Mr. Wells’s or any other, as a subject for the imagination, “The future,” says one letter, “is what moves. Can you live without moving?” I can’t, and that is why I made the remark. The future does not move for me, or at any rate it does not keep moving beyond the point where my vision—which may be abnormal—comes naturally to rest. In the midst of so much time and space my imagination is paralyzed, for the same reason I suppose that to any human eye the universe of stars, furiously though these stars are said to be headed across the heavens; is stationary. I can imagine a number of changes for the better in man’s life on earth—changes which have a meaning in man’s present predicament—but of course that would be only a beginning. What then? And then? And then? The present is all that we can know, and by the same token it is all that we can imagine. And it is if anything too moving. Two films since Things to Come have made me philosophical once more. I am sorry for this, and hope to be literary again at least by Decoration Day. The films are Mr. Deeds Goes to Town (Music Hall) and The Passing of the Third Floor Back (Fifty-fifth Street Playhouse). Perhaps I cannot be blamed for being philosophical about them, since that is what they are trying to be; the first with more success in my opinion than the second, but neither one of them with anything like the success of Plato’s Phaedo, the four Gospels, or Don Quixote. Socrates, Jesus, and Don Quixote came into the world to save it, and their distinction is that they failed; or rather the distinction of their creators is that none of them tried to write a success story. The notion that the world needs changing is best sewed by the story of how it could not be changed. Any story of how the ideal became the actual is not only incredible, it is unimaginable—like that future of Mr. Wells’s which is going to be different from the present. The failure of Don Quixote is one of the greatest things a man ever thought; and the success of Mr. Third Floor Back is one of the smallest. He changes everybody in the boardinghouse where he lives. And then? The mind stops; whereas it has been going on with Don Quixote for three centuries, and so far as I know can go on forever. We can never forget what the Don wanted, for we want it ourselves; but we shall not remember what the Stranger got, since what he got was necessarily unbelievable, or if believable trivial, like the messages which mediums bring from the spirit world. “The Passing of the Third Floor Back” grew unreal as it grew explicit, and it grew so explicit that Conrad Yeidt as the Stranger seemed nothing better than an amiable old magician as he faded through the front door. His light went out because it failed to fail. Mr. Deeds is something different and better. As Robert Riskin conceived him, as Frank Capra directed him, and as Gary Cooper very admirably acted him, he becomes indeed one of the most interesting figures ever thrown on the screen. Truly an innocent, truly a virtuous and rational young man, he is so empty of spiritual pride as in the end, when it has been made clear to him that the world is corrupt and crazy, to desire nothing save silence even in the court where his sanity is being tried. The weakness of the film is not that he rises at last in defense of himself, but that his defense succeeds—the implication being that New York henceforth will honor such men, whereas we know of course that it will do nothing of the sort as long as it consists of people like ourselves. The perfect irony would have been for Mr. Deeds’s completely brilliant and convincing argument to fail of its practical purpose. Yet perfect irony happens in literature only about once in a thousand years, so with a bow to it we can go on to say that Mr. 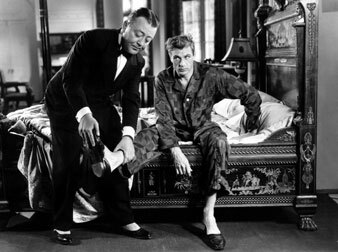 Deeds is really a very intelligent and beautiful affair, a film no less charming than Mr. Capra’s It Happened One Night at the same time that it is definitely more profound. The idea which fills it almost to the limit is an idea of eternal importance, and it has been translated with great skill into the concrete language of art—nowhere more so, as I have suggested, than at those moments when Gary Cooper as Mr. Deeds grows modest about his virtue and all but ashamed of it. He is never quite ashamed. It is rather that he cannot understand why other people do not have the virtue too. To him his wisdom is not wisdom; it is a minimum of horse sense, it is merely the starting point for an inquiry. This is what throws the wisdom of the world into its proper relief; and what makes the film on the whole both so interesting and so plausible. I should leave Mr. Wells alone, but I remember having said that the actors in his film did not know how to pretend that they believed its lines, and I am particularly pleased with the commentary on this which is furnished by another British film. Sir Cedric Hardwicke, who managed to be totally lifeless as the sculptor in Things to Come, is so good as David Garricli in Peg of Old Drury (Bijou) that his performances as Shylock, Richard III, and Abel Drugger become in their turn convincing. It is an excellent costume piece and a delightful story in spite of the violence it does to history. For Peg Woffington (Anna Neagle) lived no such life as this; she had many lovers besides Garrick, and she lived quietly in Teddington after her retirement from the stage—instead of dying in Garrick’s arms at the end of a plucky performance as Rosalind. Mark Van DorenMark Van Doren (June 13, 1894 – December 10, 1972) earned a PH. D at Columbia University and taught there for nearly forty years. His 1939 volume of Collected Poems won a Pulitzer Prize in 1939. He also wrote several novels and a play, "The Last Days of Lincoln," (1959). He served on the staff of The Nation from 1924-1928 and again from 1935-1938.